Maltodextrin, Citric Acid, Natural Orange Flavor, Acacia And Guar Gum, Malic Acid, Silicon Dioxide, Annatto Oil (For Color), Sucralose, Magnasweet®, Acesulfame, Cinnamon Bark Extract. 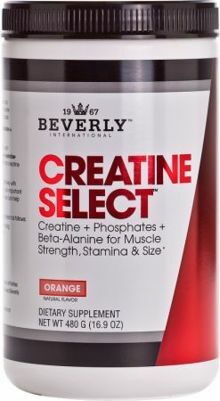 Pile On The Plates Eith New & Even Stronger Creatine Select! Each ingredient in new CREATINE SELECT has been tested and reviewed for purity and carefully balanced for maximum pharmacokinetic and pharmacodynamic impact. Finally, BI's product development scientists left no stone unturned in making CREATINE SELECT the very best tasting formula of its kind!